Don't Miss the 4th Annual Boulderham Climbing Competition! The 4th Annual Boulderham Climbing Competition at VITAL Climbing Gym in Bellingham is coming up soon and we can't wait for the fun to begin! 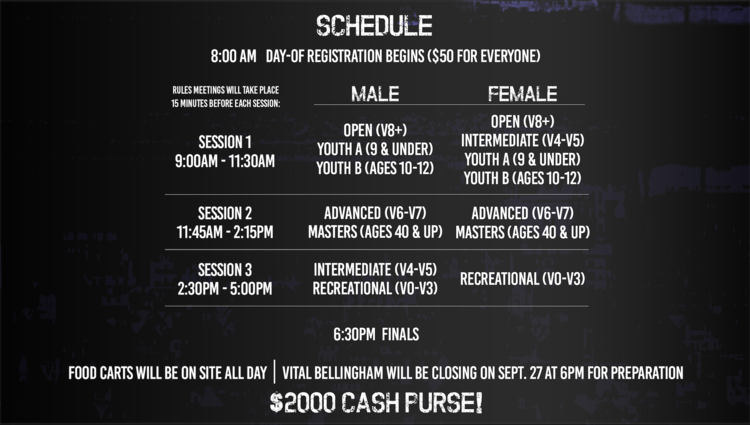 This years Boulderham will be on Saturday, September 30th stretching from about 9:00am to 8:00pm with the FINALS beginning at 6:30pm. If you have never been to a VITAL competition before, you really owe it to yourself to come check it out! Their events are a ton of fun for participants and spectators. All skill levels are welcome! Even if you just started climbing, you might take first place in your category and head home with some sweet prizes! Everyone is encouraged to come by, drink some booch, cheer on your friends, and have a great time. Kombucha Town is proud to be a major sponsor of the event this year alongside some of the other local Bellingham breweries including Kulshan Brewing Co., Aslan Brewing Co., and Stones Throw Brewing Co. Tons of other great companies and brands are sponsoring the event as well and you can see the full sponsor list in the image below.